A dermatofibroma is a common benign fibrous skin lesion. A dermatofibroma is also sometimes called a histiocytoma. Dermatofibromas are dome-shaped, are pigmented (or have a ring of pigment), and usually (but not always) occur on the legs and arms of young and middle-aged women. The cause is unknown but some believe it arises at the site of a minor injury, especially an insect bite or thorn prick. Once developed, they usually persist for years. They appear as firm-feeling nodules, often yellow-brown in colour, sometimes quite dark, especially in dark coloured skin. 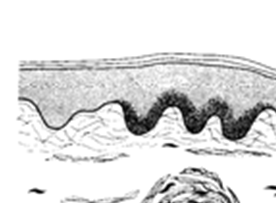 If the skin over a dermatofibroma is squeezed a dimple forms, indicating tethering of the skin to the underlying fibrous tissue. A dermatofibroma is of cosmetic significance only and seldom causes any symptoms. Classic Dermatofibromas have virtually no potential to become skin cancer, however, aggressive large growing dermatofibroma like lesions rarely occur and can be cancerous. Any large growing dermatofibroma like lesion should be evaluated. Smaller, well circumscribed classic dermatofibromas are harmless. Dermatofibromas are smooth, firm, dome shaped or slope shouldered papules of 10-15 mm in diameter. Interestingly, dermatofibromas most commonly occur on the lower legs, but the thighs and shoulders are also frequent sites of occurrence. The summit of the lesion is often skin colored and only light brown in color; where as, the lower portion of the lesion and immediate adjacent normal skin are usually a bit darker in pigmentation. A diagnostic clue to determine whether or not a lesion is a dermatofibroma: When a genuine dermatofibroma is compressed between the thumb and forefinger, the dermatofibroma will "pucker" in. This puckering change is surprisingly reliable in distinguishing a dermatofibroma from other types of pigmented papules. Dermatofibromas are common lesions. They can be found in 20% of women and 5% of men. One theory is that dermatofibromas may be the result of an old insect bite or minor injury to the skin in which cutaneous fibrosis results. Microscopically, dermatofibromas consist of clustered fibroblast skin cells. Fibroblast skin cells are tiny cells of the skin that are responsible for producing collagen. Dermatofibromas are benign lesions and malignant potential is exceedingly rare. There are those dermatologists who believe that dermatofibromas may very rarely become a cancer called malignant fibrous histiocytoma. On the other hand, other dermatologists may disagree with this. Dermatofibromas, like other pigmented lesions of the skin, may darken during pregnancy. When these changes occur, they may be confused with melanoma. In general, 90% of the time, no biopsy or therapy is necessary for classic dermatofibromas. Occasionally, lesions will need removal in order to rule out melanoma or another skin tumor. If the lesions are bothersome or unsightly, removal may be desired. This is usually personal preference on part of the patient.